Waiting For Maggie: Thursday, February 1st 7:00 a.m.
Thursday, February 1st 7:00 a.m.
Miss Maggie is still sleeping, so here's my chance to talk to you guys today. There's another sign from the zoo that I thought you guys would like. Buddha - you definitely would NOT have like this zoo. They kept a few dogs there and one of them looked like Jack! Bad news. Most of the zoo was wide open with quite a lot of room for the animals to roam, but some areas were very old fashioned and the animals were kept in small cages. 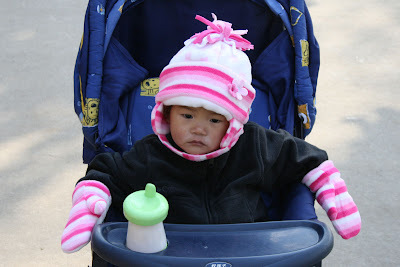 She also has issues with wearing the mittens, especially when Mama puts them on the wrong hands! She can't eat Cheerios with mittens on! Bad Mama. This is the face we get a lot from her - kind of sad and wishing we would all just go away and leave her alone. She puts up with a lot. We also have met "Fits" a few times. Lori and Meaghan know all about "Fits". She can pitch one faster than anybody's business! Oh, she gets mad at us sometimes. (Like yesterday when I put her down to comment on Bryan's post) And loud - she's really loud. I guess I prefer p.o'd to sad, so we deal. Being p.o'd takes an investment on her part. Anyway - it's time to wake her up and go to breakfast. Today her passport will get delivered! And tomorrow we leave for Guangzhou, the Chinese process is almost done and it's time to go do the US side. Added plus - the weather in Guanghzhou is in the low 70's. Very nice. Here's one more pic of Maggie last night after noodles. About the outfit - she's wearing pj's as long johns because we have to keep her covered when we go out. No bare skin, I may have mentioned that. We took her jeans off when she pooped. Yay - she pooped! Noodles + poop = Happy Baby. Hug this kid 'til she can't breathe. This stuff takes time! How can I keep my person from jumping over the rail? 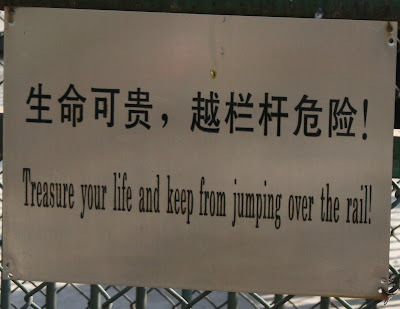 I noticed that Chinese letters above look like someone jumping over the rail. She is so cute. Looks like she has a bit of mischief in her... I love the stroller pic. Mary can you guess at an american toddler size for her? 3T maybe? I want to go shopping.... and Mike never says a word he knows its cheaper than getting our own new baby. Take care. When do you head for home? Bryan, she still looks a little like you did in some pictures excpt for the coloring of course. Good to see that contented smile. Great picture! You're in for a shock if you're coming back soon. Last night it was -17 degrees and -30 windchill. It's supposed to get worse tonight too. Everything is fine. We're just sick.